Tumors of the gluteus maximus (buttock) are often extremely large before diagnosis. Traditionally, low- and high-grade soft-tissue sarcomas of the buttock were treated by aposterior cutaneous flap hemipelvectomy. Today, however, most low-grade soft-tissue sarcomas of this muscle can be resected with safe margins. Hemipelvectomy is not required. Resection involves complete removal of the gluteus maximus muscle and ligation of the inferior gluteal vessels. The underlying sciatic nerve is preserved. 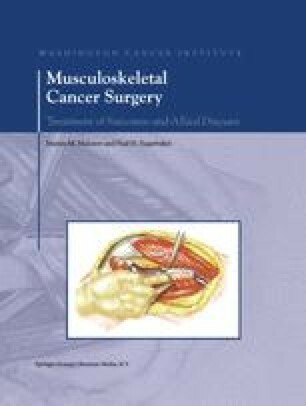 Most high-grade sarcomas of the gluteus maximus can similarly be treated by surgical resection. Preoperative induction chemotherapy, intra-arterial chemotherapy, or radiation therapy is required. Radiation therapy may also be required depending on final margins. The gluteus maximus is a “quiet area” for soft-tissue sarcomas. The only significant structure that must be evaluated is the sciatic nerve. Minimal reconstruction is required. During the postoperative period it is important to take measures to prevent the formation of large postoperative seromas. The functional outcome of a resection of the gluteus maximus is a minimal deficit in hip extension only. The gait is normal. Today a hemipelvectomy is rarely required for most soft-tissue sarcomas unless they are extremely large and/or are accompanied by fungation, infection, or extension into the ischiorectal space, pelvis, and hip. Direct sacral involvement, which is rare, necessitates an amputation.